Geodesy and cartography of planets and their satellites are natural extensions of the same scientific disciplines that are used to describe the size and shape of Earth, define its coordinate system, develop control nets, measure gravity fields, and produce accurate, useful maps. The techniques for making planetary measurements are frequently very different from those used on Earth, and the accuracy is generally not as high. Yet the data-including basic parameters such as rotation rate and average radius and shape, as well as detailed global and regional maps showing the extent and relative locations of surface features and (in the best of cases) their vertical relief-are essential to all geologic and physical studies of planets and satellites. 1. A body-fixed, mass-centered coordinate system must be defined for the planet or satellite and related to an inertial astronomical coordinate system (such as the 1950.0 Earth equatorial coordinate system). For this purpose, a prime meridian must be defined once the rotation rate and the spin axis of the body have been determined. 2. The size and shape of the planet or satellite must be measured and a control network consisting of the coordinates of a large number of identifiable surface points established. This topic is generally referred to as geometric geodesy. 3. The mass and mass distribution must be determined, and the coefficients of the spherical harmonic expansions of the gravity potential derived. This topic is generally referred to as physical geodesy. 4. Surface features and other physical data must be depicted on planet-wide, detailed maps for scientific, engineering, and navigation purposes. In summary, for all the bodies of the solar system, we seek to determine the rotation rates, the directions of the rotation vectors the sizes and shapes, and the masses and gravity fields. We also desire to establish the location and elevation of surface features and produce maps that portray these and related surface properties. The importance of lunar and planetary geodesy is discussed in Geodesy: Trends and Prospects (National Academy of Sciences, 1978), and the fundamental role of global maps in planetary research is stressed in Strategy for Exploration of the Inner Planets,1977-1987 (National Academy of Sciences, 1978). Sources of data include Earth-based optical telescopes and radar, Earth orbital telescopes, and flyby, orbital, and landing spacecraft. The accuracy with which various parameters can be determined varies greatly with the type of mission to a particular planet or satellite and, of course, with the number of such missions and with the instrumentation each carries. Orbiters and landers have investigated the Moon and Mars, so data for these two bodies are the most accurate. Flyby missions have flown past the Moon, Mars, Mercury, and the satellites of Jupiter and Saturn, obtaining essential gravity and imaging information. The Pioneer Venus Mission carried a radar altimeter that yielded elevation measurements of the topography and low-resolution imaging. Both the United States and the Soviet Union have vigorous programs designed to explore the solar system and extensive cartographic efforts to exploit the abundant pictorial data from their missions. Table 2.- Important Missions and Cameras That Acquired Pictures Used for Large Area Control and Mapping of Planets and Satellites. ....understand and portray the structure and characteristics of the surface. For most bodies there exists a mixture of imaging data-high resolution in some regions and low in others. Since resolution is very important to understanding the nature of the surface, there is always the desire to seek as high resolution as possible. On the other hand, for computing control networks and compiling maps, it is important to have overlapping contiguous coverage. Thus, in the tradeoff of resolution and coverage, cartographers vote for coverage first, resolution second. For terrestrial applications, aerial photographs are commonly used in the production of maps (American Society of Photogrammetry 1980). For this purpose, mapping or metric cameras are specially designed to have almost distortion-free optics. The only planetary missions that carried similar cameras were Apollo 15, 16, and 17 and the Soviet Zond 6 and 8; of course, the film from such cameras must be returned to Earth. Most missions to the distant planets carried television camera systems or photographic- film with onboard processing and line-scan readout. The geometric distortions  inherent in these systems were calibrated and removed in the measurement of the pictures. Measurements of the control point locations on the pictures are incorporated in an analytical triangulation that determines the planetary coordinates of the control points on the surface. In this application, the pictures cover a large region, or perhaps the entire surface, of a planet or satellite. The standard error of the residuals in the analytical triangulation provides an overall estimate of the accuracy of measurements of the control point locations, the ability to remove the camera's geometric distortions from the measurements, and the quality of other parameters incorporated in the computation. Typical values for the standard errors are given in the last column of Table 2. For mapping purposes, large image formats are preferred to small ones; high resolution and contrast are important. In photogrammetric work, this requirement translates into large format and small standard error of measurement. Based on this criterion, the film-return camera systems (Apollo 15, 16, and 17 and Zond 6 and 8) are best, and the television camera systems flown on missions such as Mariner and Voyager are the poorest. The conventional aerial camera has a well-calibrated wide-angle lens and large format, whereas the typical planetary camera has a narrow-angle lens and a small format and usually is subject to large electronic distortions that are difficult to calibrate. Some bodies of the solar system, such as the planet Venus and Saturn's satellite Titan, have dense cloudy atmospheres, making it impossible to image their surfaces with conventional cameras. These surfaces must be explored with radar. Earth-based radar (at Arecibo and Goldstone) and the radar altimeter on the Pioneer Venus mission produced limited but exciting cartographic data for Venus. However, the planet-wide mapping of Venus will have to await data from future orbiting radar missions. A working group on the cartographic coordinates and rotational elements of the planets and satellites was established at the International Astronomical Union (IAU) General Assembly at Grenoble in 1976. This working group reported to the IAU General Assembly in 1979 (Davies et al., 1980; Davies, 1982). A somewhat smaller group was established in 1979 with overlapping member  ship with the 1976 group to make necessary changes anticipated in the light of the Voyager encounters with Jupiter and Saturn. 1. The rotational pole of a planet or satellite that lies on the north side of the invariable plane shall be called north, and northern latitudes shall be designated positive. 2. The planetographic longitude of the central meridian, as observed from a direction fixed with respect to an inertial coordinate system, shall increase with time. The range of longitudes shall extend from 0° to 360°. As a result of principle 2, bodies with prograde rotation such as Mercury, Mars, and the satellites of Jupiter and Saturn have longitudes that increase from 0° to 360° from east to west. However, the retrograde rotation of Venus and of the satellites of Uranus result in longitudes that increase from 0° to 360° from west to east. Exceptions to Principle 2 are the Moon and Earth, where longitudes from 0° to 180° are measured east and west of a prime meridian. The cartographic coordinate system is defined by reference to the planet's or satellite's axis of rotation and an arbitrarily selected prime meridian. In most cases, a clearly defined surface feature (usually a small crater) is assigned a specific longitude: Hun Kal defines 20° on Mercury, Airy-O defines 0° on Mars, Cilix defines 182° on Europa, Anat defines 128° on Ganymede, and Saga defines 326° on Callisto. Since it was not obvious how to choose a small permanent feature on lo because of the extensive volcanism, the astronomical definition is used-the prime meridian is the sub-Jupiter longitude at the first superior conjunction after 1950.0. The prime meridian of this moon passes through the mean sub-Earth direction. The rotational elements of the planets and satellites are derived relative to the standard celestial equator and equinox of the 1950.0 inertial coordinate system, and time is measured in ephemeris days or Julian ephemeris centuries of 36 525 days from the standard epoch of 1950 January 1.0 ET (or JED 2 433 282.5). The direction of the north pole is specified by its right ascension, , and declination, . The prim! 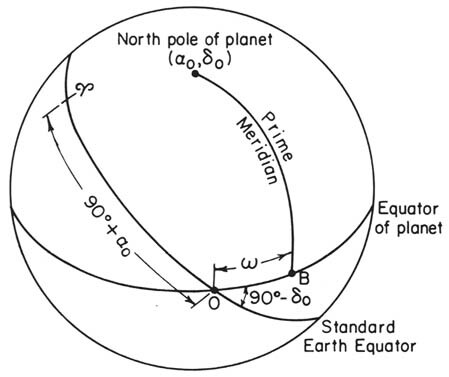 meridian is specified by the angle, , measured along the planet's equator on the standard equator to the point, B, where the prime meridian crosses the planet's equator (see figure  below). If increases with time, the planet has direct rotation; if decreases, the rotation is retrograde. For the planets, expressions for , , and are relatively simple, since precession periods are long, and mutual gravitational perturbations are small. On the other hand, the corresponding expressions for the satellites are frequently complex, as the theory of their motions contains many terms. Expressions for , , and for planets and satellites for which maps are currently being made are summarized by Davies (1982). Table 3 contains the updated parameters for the reference spheroids for those planets and satellites in the current cartography program. Definition of the prime meridian of a planet or satellite. Table 3.-Recommended Reference Spheroids for the Planets and Satellites in the Cartography Program. Nonphotogrammetric data have been crucial to the development of both horizontal and vertical control nets on some objects. Analysis of laser ranging of lunar retroreflectors and differential very-long-baseline interferometry using ALSEP* transmitters has revolutionized the study of lunar dynamics and provided extremely accurate coordinates for a few points on the lunar surface (Bender et al., 1973; Ferrari et al., 1980). Analysis of radio tracking data from both Viking Landers has led to very accurate values for the direction of Mars' rotation axis, rotation rate, and the coordinates of the two lander sites (Mayo et al., 1977; Michael, 1979). The Moon is the only extraterrestrial body for which telescopic photographic plates have made a significant contribution to the establishment of a control net. Telescopic data are still important and in use (Meyer, 1980) because spacecraft have not yet produced better materials for this purpose over large regions of the near side. There is no single unified control net for the Moon; control consists of patching a series of regional blocks (Table 4). Vertical control is computed photogrammetrically in the telescopic, Apollo, and Zond nets; the Apollo laser altimeter is another source of very useful vertical data. The coordinates of the lunar retroreflectors and the ALSEP transmitters have been accurately determined (Bender et al. 1973; Ferrari et al., 1980). Moreover, the Apollo 15 retroreflector and the Apollo 16 and 17 transmitters have been located on the panoramic pictures and their locations transferred to the mapping pictures (Schimerman, 1976), so these coordinates can be used directly to constrain the Apollo control nets. Table 4.-Control Nets of Planets and Satellites Based on Pictures Taken by Spacecraft. ....of 2439 km. This radius is consistent with two occultation measurements made when the Mariner 10 spacecraft passed behind Mercury (Howard et al., 1974) and the measurements made from groundbased radar (Ash et al., 1971). The computation of the planet-wide horizontal control net of Venus will have to await data from a future Venus orbiting radar mission. However, the radar altimeter on the Venus Pioneer mission provided very good elevation data, so that for the first time the vertical control on a planet is more refined than the horizontal control. The Mariner 9 spacecraft acquired pictures of most of the surface of Mars at approximately 1 to 2 km resolution, making it possible for the first time to compute a planet-wide horizontal control net from a single source. Later, data from Viking Orbiter 1 and 2 pictures were included (Davies et al., 1978). The location of the Viking 1 lander on the surface of Mars was identified on highresolution Viking Orbiter pictures (Morris and Jones, 1980), and accurate coordinates of the Lander site (Michael, 1979) were incorporated into the analytical triangulation. Vertical control on Mars has been derived from many sources (Wu, 1978); these include Mariner 9 and Viking 1 and 2 radio occultations, ground-based radar observations using the Haystack and Goldstone antennas, and measurements by the Mariner 9 ultraviolet spectrometcr, infrared interferometer spectrometer . The Voyager 1 and 2 encounters with Jupiter provided numerous images of the Galilean satellites Io, Europa, Ganymede, and Callisto. Measurements of points on these pictures are being used to establish horizontal control nets and calculate mean radii (Davies and Katayama, 1980). Because these were flyby missions, the resolution varies greatly with longitude on these bodies. The Voyager I encounter with Saturn produced images of the satellites Mimas, Tethys, Dione, and Rhea with good resolution over some regions. Measurements of points in these pictures are being made and horizontal control nets computed. So far radii have been determined only by limb measurements (Table 3). As the exploration of the solar system proceeds, work on the control nets will continue as new data become available. Shaded relief map of Saturn's satellite based on Voyager images. Preliminary shaded relief map of Saturn's satellite Mimas, showing the locations of control points. Research on the gravity fields of planets and satellites has progressed rapidly and has been recognized as an essential aspect of solar system exploration in Geodesy: Trends and Prospects and Strategy for Exploration of the Inner Planets:1977-1987 (National Academy of Sciences, 1978). A large number of measurements must be made to characterize the gravity field, and, since the number of missions to any body is still relatively small, there are gaps in the desired data. However, significant progress has been made in the cases of the Moon, Venus, and Mars. The first parameter of the gravity field to measure is the mass, which can be determined either from Doppler tracking of a flyby spacecraft or from the period of revolution of an orbiter. The gravity field of a planet or satellite is usually described in terms of its spherical harmonics (Cook, 1973). The values of the harmonic coefficients can be derived from observations of the motions of orbiting natural satellites; however, the preferred method is from analysis of Doppler tracking of an or-biting spacecraft. Data from both a low-altitude, high-inclination orbit and a high-altitude, low inclination circular orbit are desirable. In practice, orbits are not optimum, and it is necessary to try to obtain the best possible results from available data. Table 5 gives values for the masses and J2 for planets and satellites in the cartographic program. Values for the mass and J2 of Mercury were derived by Esposito et al. (1978) from the first and third Mariner 10 flybys. Because this was a flyby mission, it was not possible to obtain estimates of higher-order harmonic coefficients. The mass of Venus was determined by analysis of Mariner 5 (Anderson and Efron, 1969) and Mariner 10 (Howard et al., 1974) tracking data acquired during their flybys. Analysis of 220 days of Doppler radio tracking data from the Pioneer Venus orbiter has given values for the sixth-degree and sixth-order harmonic coefficients of the gravity field (Ananda et al., 1980). As the mission continues, additional data should increase confidence in the results and perhaps permit solving for higher-order coefficients. Table 5.- Values of the Masses and J2 for the Planets and Satellites in the Cartography Program. ....solve for a sixteenth-degree and sixteenth-order gravity model (Ferrari, 1977) and even one of the twentieth degree and twentieth order (Ananda, 1977). A new solution for low-order harmonic coefficients has been obtained by combining laser ranging data from the retroreflectors with Doppler tracking of Lunar Orbiter 4 and simultaneously solving for the lunar orbital elements, libration parameters, and seventh-degree and seventh-order harmonic coefficients (Ferrari et al., 1980). The best measurement of the mass of Mars was derived from Mariner 4 data (Null, 1969). Studies of the gravity field of Mars were based on tracking data from the Mariner 9 spacecraft. For example, Sjogren et al. (1975) end Jordan and Lorell (1975) derived fourth-degree and fourth-order harmonic coefficients for the planet. Doppler tracking data from the two Viking orbiting spacecraft were combined with the Mariner 9 data to improve the understanding of the gravity field of Mars by Gapcynski et al. (1977) who derived sixth-degree and sixth-order harmonic coefficients, and by Christensen and Balmino (1979) who developed a twelfth-degree and twelfth-order gravity model. The masses of the satellites of Jupiter and Saturn have been derived from observations of perturbations of their orbits. Recent  Voyager tracking data will improve some of these values. The values of J2 listed for the satellites in Table 5 were obtained by Dermott (1979), assuming that the bodies are in hydrostatic equilibrium. These satellites are all in synchronous rotation, and those close to their primary bodies are elongated in the planet's direction by tides. This factor accounts partly for the large values of J2 for Io, Mimas, Enceladus, and Tethys. Maps of the Moon have been prepared by astronomers since the time of Galileo. Shortly after the first spacecraft flew by the Moon, a program to produce lunar maps was started at the Aeronautical Chart and Information Center (ACIC), St. Louis, Missouri (Kopal and Carder, 1974). In modern terrestrial mapping, landforms are delineated by highly detailed contour lines, along with symbolic portrayal of cultural and hydrographic features. In the absence of cultural and hydrographic features on the Moon, accurate landform delineation is vital, yet data for contour compilation are extremely limited. Special airbrush techniques were therefore developed by skilled artists to portray the relief seen in pictures (Inge and Bridges, 1976; Batson, 1978). With practice and experience, the artists perfected their techniques and became expert photointerpreters as they studied pictures from many sources-telescopic photographic film, spacecraft photographic film, and spacecraft television images. Currently all lunar and planetary maps are produced at the U.S. Geological Survey in Flagstaff, Arizona. Some map series use mosaics to illustrate the topography, although mosaics are not as attractive as the artists' shaded relief painting and contain less information. The problem of representing a spherical surface on a flat map has led to the development of a large variety of map projections. In the planetary program, conformal projections are popular because craters are common topographic features, and most of us like to see round craters round. In planetwide mapping series, Mercator projection sheets are usually used in the equatorial band, Lambert conformal projection sheets in the mid-latitudes, and stereographic projection in the polar regions. Special-purpose large-scale maps are made on the above projections and occasionally on orthographic or transverse Mercator projections. Computers generate and maintain data bases for map compilation. Using geometric parameters from the control net analytical  triangulation or from the Supplementary Experimenter Data Record (SEDR), the television pictures can be geometrically formatted into any one of the common projections for mosaics. The making of the mosaic can be carried out in the computer or by hand. The reference surfaces of the planets and satellites in the cartographic program are given in Table 3. All are taken to be spheres except Mars, for which a spheroid is assumed (de Vaucouleurs et al., 1973). Contour lines have been added to some of the maps, indicating topographic elevations with respect to a defined datum. The datum for Venus and the Moon is a sphere, whereas the datum for Mars is defined by the fourth-degree and fourth-order spherical harmonic gravity field, with the zero altitude defined by the 6.105 mbar atmospheric pressure surface at a temperature of 273.01 K (Wu, 1978). This pressure and temperature correspond to the triple point of water. The planetary mapping program has produced global maps, planetwide mapping series, and special-purpose maps, as well as globes and atlases (Batson, 1981). The global maps and mapping series, summarized in Table 6, include shaded relief, albedo, and topographic maps, mosaics, orthophotomaps, and color mosaics. Most of them have been digitized and are available in computer-compatible format. A large number of special maps have been produced. Many special maps of the Moon were made to support the Apollo Landing site selection and the Apollo lander operations. On Mars, special maps were produced to aid in the Viking Lander site selection process. Many special maps have been generated in support of particular planetary geology studies. Usually the special maps are at larger scale than is available in a planetwide series. The International Astronomical Union (IAU) has established an organization responsible for the naming of features discovered on planets and satellites. The IAU Working Group for Planetary System Nomenclature was organized in 1973, with individual task groups for the Moon, Mercury, Venus, Mars, and Outer Solar System reporting to the working group. These task groups are responsible for the names that appear on the maps. Table 6.- Global and Planetwide Mapping Series. Table 6.- Global and Planetwide Mapping Series- continued. NOTE: There are no plans to complete all the sheets in some map series, and in others the necessary data will be received from future planned missions. ....data and synoptic coverage. Medium- and large-scale maps are of particular interest to planetary geologists as base maps for geologic mapping. They are also important in planning spacecraft landing areas and the surface navigation of rovers. Planetary geodesy and cartography continue to supply the basic data products without which detailed geologic investigations of planets and satellites would be impossible. Geodesy supplies fundamental parameters such as the average radius, shape, and rotation rate of a body, as well as precise determinations of spin axes. Accurate determinations of radii are needed to calculate mean densities from masses and thus obtain information on the general composition (chapter 4). Data on shapes, when combined with density and rotation rate information, can be used to place constraints on the internal structure of an object (chapter 5). Cartography continues to supply detailed global and regional maps showing the extent and relative locations of surface features and, in the best of cases, their vertical relief. Such cartographic products are essential to geologic mapping and to detailed investigations of the geologic evolution of solid surface bodies, as well as to the planning of future missions. Clearly, a major objective of any exploratory mission in the solar system must be the gathering of data that will permit the required first-order geodetic and cartographic work. Unfortunately, this objective has not always been met  in the past. For example, in the case of Mars, in spite of missions as sophisticated as Viking, we still lack accurate altimetry for most of the planet. This and similar fundamental gaps in our knowledge should be remedied as our efforts to explore the solar system continue. We should also anticipate the need to develop geodetic and cartographic techniques suitable for dealing with small, irregular bodies: asteroids, small satellites, and perhaps even comet nuclei (chapter 7). *Apollo lunar surface experiments package.